Before sowing you have to think about the potential problems from carrot fly and parsnip canker that may put paid to your crop – sow resistant varieties such as ‘Avonresister’ and ‘Archer’, and try growing them in containers or drums if you’re being cautious, as this will prevent carrot fly from reaching your plants and destroying them. You’ll also have to cover them over of you don’t want nibblers such as mice coming to eat your tender foliage as it grows! Plus, if you’ve got stony ground, try and remove as many stones as possible and create a smooth tilth, or you may get forked roots. You can pre-germinate your seeds in a plastic bag of moist compost to ensure germination – pop them in an airing cupboard, after a few days you’ll see little leaves emerging and then plant them up into your drill line. 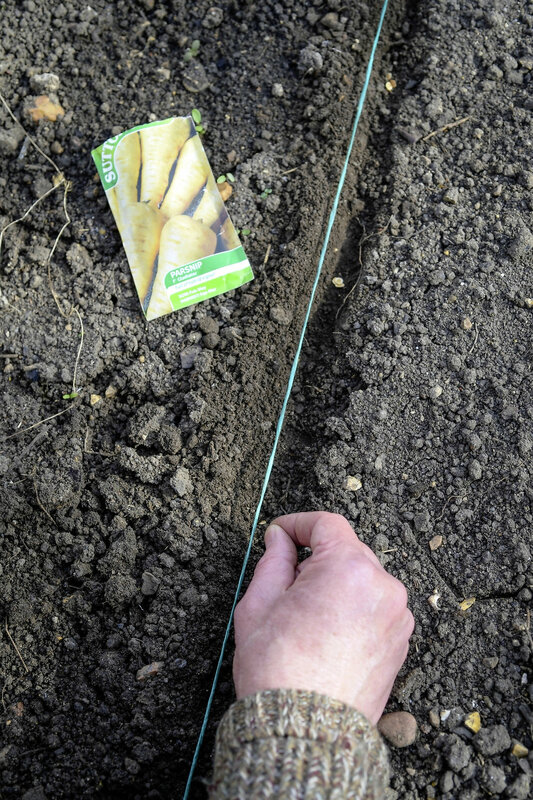 This is a failsafe way of germinating, but you can always sow traditionally straight into your beds as per below, as long as you give your parsnips room to grow in a sunny spot with light crumbly soil. 1) Lay a string line tight, fixed with a stake each end. Use a hand hoe to loosen soil. 2) Make a drill as your planting hole 3 – 4cm (1.5 in) deep with a trowel. 3) Sow a few seed 7 – 10cm apart all along the row. 4) Cover the seed over, firm down the soil and water in well. Promptly removing faded flowers not only smartens up the appearance of pots, hanging baskets, border perennials and shrubs, but also stops the plants being able to turn that flower into a fruit, expending energy on needless production of seed. Instead, that energy will go into creating more flowers and if you keep deadheading those, the cycle continues – essentially, you’re tricking the plant into producing more and more flowers, which means more colour for you! Some plants practically pack up the moment a seed head is produced – sweet peas for example – so your vigilance really will be well rewarded. Make it a regular job at this time of year, going round the garden with snips and a bucket for the dead-heads each morning or evening, to catch any spent flowers before they have a chance to mature. Others will carry on producing flowers if you leave a few dead ones on – pelargoniums, petunias – but can look messy if their new flowers have to jostle alongside browning flower stems. Their subsequent flowering will be much better if the dead blooms are removed, and you’ll also reduce the risk of fungal disease, such as botrytis, infecting the dying tissue. Different plants need different techniques, depending on how they flower and the length of their stalks and stems. Remove whole stalks from plants such as hemerocallis, rather than just the dead flowers at the top. Cut right back to the base for a neat tidy finish. Plants such as cosmos just need to have individual faded flowers removed, cutting back to a main stem from where more flowers will be produced. If early flowers such as polemonium hardy geraniums and foxgloves are deadheaded - cutting back quite hard - they'll often go on to produce a second flush. Although onion sets when they’re available are easy to just pop in the ground, it’s so much more satisfying to enjoy the whole germination process and grow onions from seed. Sown in the winter onions will be ready in early summer next year, up to a month before normal maincrop onions. They like very well-drained soil where they won't fall foul of winter wet, so fork some extra grit or sand into the sowing area to help improve drainage. Try to get the seeds sown by the end of the month. That will give them time to produce good-sized bulbs by winter, which will be able to withstand whatever the weather throws at them. Fully-sized bulbs should be ready by next July, but you can also harvest leaves from them earlier for a bonus ‘spring onion’ crop. Keep the soil well watered up until germination, which should occur just a few days after sowing, in warm, damp soil. After germination, thin out the seedlings to leave a seedling every 15cm (6in) along the row. Find a spacious area that can be devoted to your onions and, using a fork, crumble the soil into a fine tilth. Sow seed sparingly along a row, taking care to keep it in a straight line. Cover and water the seed in well. Be sure to mark your onion row clearly. It’s always funny to think of growing such an iconic October plant right now at the height of spring, but you have to start somewhere to get those monster crops! In fact, why not join in with Thompson and Morgan’s National Pumpkin Sowing Day on April 12? This date has been set by the seed company to inspire people to grow their own whoppers at home, to try and beat last autumn’s weigh-in winner that reached over 2000 lbs! As with all members of the pumpkin family, it’s slightly too early to sow them directly outside, but it’s prime time to sow them in little pots for keeping indoors, in good, moist seed compost, in a light spot of around 20 – 25C. Sow the large seed on their sides about 2.5cm deep and cover over with more compost. Place on a warm windowsill or in a simple propagator and wait for germination – you can then plant them out next month. Have you got the space to grow them? If you’re not fussed about growing to show and compete and want a small crop, try the variety ‘Wee B Little’, a brilliantly named tiny pumpkin for the smaller plot from www.marshalls-seeds.co.uk. For real monsters to take up your whole allotment, go for ‘Dill’s Atlantic Giant’, a record-breaking variety. Marvelled at for the way they can cope with harsh weather, and known for poking their dainty-looking flowers even through heavy snow. They grow a few inches high and like to form little clumps under trees, but they also grow beautifully in pots. Hepaticas’ delicate beauty is well worth adding to your clumps of early spring bulbs in the garden, and there’s nowhere better for them than in a little woodland dell under deciduous trees and shrubs. They like a bit of sunshine to flower well, so need specific conditions – shade for most of the year under the newly-grown, leafy canopy of a tree, and then dappled spring sunshine under bare branches before they re-leaf. For outdoor cultivation in this country, it’s best to grow the European species such as Hepatica nobilis and H. transsilvanica, as they’re naturally best suited to our climate. Plant potted plants now from suppliers such as Ashwood Nurseries (www.ashwoodnurseries.com) and Edrom Nurseries (www.edrom-nurseries.co.uk). Plant them in a very well-drained, fertile spot that gets good sun in early spring only. Add leaf mould or compost to the planting hole and water in well through their first season. Too much water will cause rotting, however. Feed in autumn with leaf mould and add a general fertiliser in late winter to help them flower in the new season. Sow fresh seed in late spring or summer in wide pots placed in a shady position outside. Use two parts of John Innes No 2 compost, one part Perlite and one part of multi-purpose. Water well, and once they have germinated, bring indoors. A year later, prick out, pot on, then plant out. Plant visible clumps to appreciate them on their own, or plant among other woodland spring bulbs such as snowdrops, trilliums or erythroniums. Anything accompanying them that’s too vigorous will take over. What better way to start a summer’s day than stepping out of your back door and picking a delicious, tangy blueberry or fragrant strawberry? Growing your own fruit and veg is always hugely satisfying, and to my mind, it’s even better when it’s easy and there’s no digging involved. Bring a bit of your allotment into the garden and grow some mini fruit on small patio in pots. If you buy potted plants much later, you risk damaging the flowers or developing fruit and sacrificing your home-grown harvests. If you want to save money, there are bargains to be had as bare-root plants are still just available from specialist nurseries and mail order. The range of peaches an nectarines available today shows you the skill of the nurseryman and plant breeder. Gone are the days when you need a huge greenhouse to cultivate them. Now you can grow these fruits at home, on the tiniest patio, as long as it’s sheltered and sunny. Dwarf peaches really are tiny. You can buy them as ready-grown pot plants just a couple of feet tall, ready to fruit away this year. They’ve long, glossy leaves and attractive pink blossom early in the year so put them in the best container you can afford as you won’t want to hide them away! As they flower so early, frost can damage flowers and reduce your crop. If a freeze is forecast during the flowering period, wrap the plants in fleece overnight. Alternatively, keep your potted peach and nectarine trees in an unheated greenhouse from November until mid-May. This can also help prevent peach leaf curl, a fungal disease that can harm both peaches and nectarines. Early flowering means they can miss out on the services of bees, so it’s worth pollinating them by hand. Wait for a sunny day and gently dab the centre of each flower with a soft paintbrush. Try peach ‘Crimson Bonfire’ from www.pomonafruits.co.uk or nectarine ‘Nectarella’ from www.chrisbowers.co.uk. Cherries are so rewarding – not only do you get pretty, white blossom in the spring and lots of juicy fruit in the summer, but often they’ll give you good autumn colour, too. There are various dwarf cherries available. If you’re unsure, look for the rootstock ‘Gisela’ or ‘Colt’. Give them a sunny spot and a generous-size container (60cm/24in or more), and don’t forget to net them against greedy birds who love them as much as we do! Put the net over as soon as the fruits start to change from green to red. Many old cherry varieties need a pollination partner, so make sure when you buy your plant that it’s a self-fertile variety, such as ‘Celeste’, ‘Compact Stella’ or ‘Sunburst’. It’s also worth noting that different varieties are different colours when they’re ripe – some will be yellow blushed with red, some almost scarlet, and some are near black, so don’t pick them under-ripe or they won’t taste as good! Available from www. pomonafruits.co.uk and www.ashridgetrees.co.uk. Suitable for even the tiniest patio, this has to be seen to be believed. Bred in Europe and sold under the name ‘Lilibarber’, this new, tiny rhubarb grows to just 30cm (12in) high! Luckily it doesn’t stop producing new stalks in the summer, like most traditional varieties of rhubarb, so you can harvest from spring right through to autumn. Don’t reach for the custard just yet though. The stalks are so tiny they need to be considered more of a garnish than a main ingredient. Apparently they’re delicious simply dipped in sugar and eaten raw. They love brassica and pea crops so be vigilant! It can be a bit of a sparse time food-wise for wildlife in January and any sign of gaps in your plant fences, nets or fleeces and birds, mice or rabbits will be straight in there to nibble them! Brassica and pea crops are vulnerable right now, so it’ll pay to be vigilant. Many animals can squeeze through gaps under or through fencing and flimsy nets, and they can often do more damage than you think. But there are ways you can try to keep wildlife at bay. Try a homemade bird scarer made of strings of old CDs tied with twine, which move and are shiny to frighten birds away, or put up tree trunk guards made of stakes and netting. You can also try animal repellent sprays, though they’re not suitable for use on edible plants, or buy sturdy fruit cages that come in all sizes (visit Thompson & Morgan, www.thompson-morgan.com, for small ones, or Harrod Horticultural, www.harrodhorticultural.com, for larger ones). These can be expensive, so here are a few tips on building a makeshift one to keep pests off. It’s wonderful that one of our most loved flowers, the sweet pea, is so easy to grow, hardy and flexible – simply sow them between around October and March in the greenhouse for beautiful spring and summer heady-scented flowers. If you sowed early, you can overwinter the young plants in a cold greenhouse and, in many places, sowing over winter can produce really robust, healthy plants. Your other option is to sow them where they’re to grow in March or April, though this usually has less satisfactory results. As sweet peas need plenty of room for their roots to grow, use toilet rolls, long modules or rootrainers filled with compost, and sow two round seeds per module, covered with 1cm (½in) more of compost. Water in so the compost is damp. You may need to chit your sweet pea seeds, using a pocket knife to remove a little bit of the outer layer to aid germination, though it’s not often necessary. A general rule is that the darker the colour of the flower variety you’ve sown, the harder the seed coating, which will need chitting. Keep seedlings cool in a greenhouse once you notice they’ve appeared, and be really careful that mice don’t nibble them all up! Put down traps, if necessary. If plants are getting leggy, pinch out the growing tip if you need to when about three of four pairs of leaves are present, which promotes bushier plants. Conifers provide a fantastic source of shelter for birds throughout the year, but particularly in winter, when they can hide and keep warm among the branches. If you’re lucky you can see goldcrests, firecrests and crossbills as well as squirrels feeding in them, too. It’s crucial to plant and look after conifers well in their early years, so they can grow into healthy trees, but to start with, check whether the conifer you’ve chosen will fit the space you’ve earmarked for it. Conifers work well in pots, so their growth can be curbed if planted in a roomy container. Once they’re planted, be sure they get enough water (but not too much), and once they’ve become established trees, they won’t need very much at all, except during dry periods. If planted in a container, though, it’s always best to check the moisture level of the compost. For new trees, give them a general feed and mulch in late winter. Once they grow larger and healthy, after two or three years, you can pretty much leave them be. This is another of those little jobs that’s fun to do at this time of year, and is so easy because succulents, such as sedums, sempervivums and echeveria for example, are so keen to reproduce, they do most of the work for you. They either produce little plantlets crying out to be potted up, or can be propagated from their own foliage. Succulents are defined as having fleshy leaves and keep themselves moist by carrying water in them. It’s a characteristic often needed in their native dry, hot, sunny countries. They’re really tolerant plants, keeping themselves pliable and happy to be moved about and disturbed, almost as if they want you to pull them apart and replant them, so they can spread themselves about more easily! Some such as kalanchoe and Aloe vera are tender and need to be kept indoors in a frost-free place and a bit of warmth in many cases. But the propagation process is easy. Simply buy some good, welldraining compost and fill little pots with it. Then it’s a case of transferring leaflets or rosettes to the pots, which often fall off into your hands readily, putting them on a windowsill and watching them do their thing! Be sure to also repot pot-bound plants in spring. Pick off a healthy sedum ‘leaf’ or a small plantlet from your succulent. Leave the offshoots to dry out a little for a couple of days. Use a well-draining compost and add small handfuls of Perlite and grit. Plant leaflets into a pot of compost, water lightly and place in a light spot. It’s easy to grow a healthy, heavy-yielding crop of strawberries in just one container, and early autumn is the perfect time to plant them up so they can get established in the warmed soil, settle in and produce more of a bumper crop come spring and early summer. Three or four plants in a large pot will give you plenty of fruit to be getting on with. They need watering and feeding all through their growing season of spring and summer, and to be kept moist at all times. Use plastic mulch on the surface of the pot’s soil to conserve water. They’re low maintenance plants, in that you can pop the bare-roots in now in some good multi-purpose compost, 20- 30cm (8-12in) apart, and they’ll furnish you with fruit next year. Make sure the crowns are at soil level and the roots have plenty of room. In many ways they’re better grown in containers as they will be spared ground soil pest and disease, though they can come up against vine weevil grubs, which can munch all the way through roots. Alpine strawberry (For shade) A great one to grow in shade. Uncultivated species with small, rounded fruits, which are tasty if not as large, juicy and sweet as cultivated types. ‘Mount Everest’ (A climber!) An ever-bearer with fruits from June to September, you can grow this one up a trellis or a large obelisk for an attractive, but tasty, display. ‘Cambridge Favourite’ (The juiciest one!) One of the best-loved varieties, great for containers and a high yield of flavoursome and large fruits. Has an RHS Award of Garden Merit. After the long wait from spring, your shallots will be ready to harvest now. As the stems start to fade to yellow, but while they’re still a little green and therefore fresher, lift the clusters of bulbs and dry them out, as you would onions. You could use a hand fork to lift them, as you can then be more sure of not damaging the bulbs so much. Bruising or slicing the bulbs accidentally means they’re more susceptible to rot during storage later on. Lay them to dry in the sunshine or, if it’s wet weather, in an airy, dry place. Once they’re drier after a few days, you can make it easier for them to fully dry by brushing off all the extra mud and loose skins from the bulbs. You can cut off the dead foliage, too. Separate the bulbs and keep them until you need to use them. Hang them in clusters using twine or an old pair of tights, or store them in a dry, frost-free place. 1. As shallots grow in large clusters, dig them out carefully with a fork or they’ll bruise. 2. Brush off extra soil and separate the clusters of bulbs so they dry better. 3. Lay out to dry in the sun in a single layer in a large tray, or lay on a tarpaulin or similar. For more 'what to do on your fruit and veg plot' subscribe to Garden News. Herb gardens and containers will all benefit from some TLC in mid-summer, when many plants are in danger of becoming tired and straggly. After flowering, herbs such as oregano, marjoram and thyme need a trim to keep them bushy. Top chefs love the unusual flavourings, so why not keep up with the latest trends! Keep up with the latest cooking from top chefs who seem to be using little-used herbs more and more these days such as cinnamon basil, hyssop, lovage and purslane – once considered common culinary and medicinal herbs in centuries gone by, but now underused. Once you’ve sown your herb garden, it’ll take a couple of weeks or more until germination. When it’s time to thin out your seedlings, a good tip is to use these thinnings in your cooking instead of wasting them, or you could pot them on. Once your plants are of a good size, they may be a little congested, so you can liberate them and transplant them to other pots or beds elsewhere in the garden. 1) Using a good multi-purpose compost, fill up an attractive long trough. Mark out three or four even-sized sections for each herb you try. 2) Thinly sow each type of herb in their respective sections and add a thin layer of compost over the top. 3) Remember to label each section, as it’s often difficult to remember what the emerging seedlings look like of each herb. 4) Water in your trough well, but not too much for fear of drowning the seeds. Place in a sunny position. Enjoy your new little aromatic oasis this summer, and remember to feed them a balanced fertiliser every week or so! The best watercress grows now, and it’s so easy to get this tasty peppery crop on the go, so why not give it a try? As its name suggests, it’s an aquatic plant species that thrives on being in water or, if grown in compost, being watered very frequently with its soil kept moist at all times. It’s actually jam-packed with goodness, too, with vitamins K and A for bone and eye health high on the list. It’s so prolific, and can be grown in all manner of containers – even just a glass of water! Take a look at our top tips below on cultivation. Fill a pot with garden soil and sow watercress seed on the surface, keeping it well-watered. When it has germinated, place the pot so the top of it is 5cm below the surface of your pond. It’ll self-seed easily, and may spread to other patches of damp ground. Watercress trimmings or any packet from the supermarket will be enough to grow some more of it. Place the stem in a glass of water, removing lower leaves so they don’t rot underwater, and the roots will grow. Change the water regularly and pot into compost once grown, watering often. 1) Using a large container, fill it to the top with good multi-purpose compost, and pat down evenly. 2) Sprinkle the fine light brown seed evenly over the surface of the compost. 3) Cover over with a thin layer of Vermiculite – seeds often prefer this than heavy compost. 4) Put your pot into a deep tray and fill it with water, and keep it filled up at all times.